TITLE: WHAT'S THE POINT or WHERE IS CHRIST? Week after week, pastors prepare sermons. They spend time working through the biblical text. Those with knowledge of Greek and Hebrew go deep into the original wording and contexts. Others use the resources like the Bible study helps; commentaries; Bible concordances; and dictionaries; available to help them understand the ancient contexts. Good preachers will take more time to read the text meditatively, letting the Word speak to their hearts prior to doing anything else. If the Word has not touched the preacher, whatever that comes out of the preacher is usually more about the preacher rather than the Word. Doing it week after week is tough. At times, preachers are tempted to just depend on the insights of others, put a few interesting stories or illustrations together, and then preach a sermon based on knowledge and other people’s advice. Like processed food, such sermons are like high-sugar calories that rather than solid food that strengthens the soul. The former puffs one up for a while before one begins to ask: “What’s the sermon point(s)?” It makes one wonder about the things said. When a sermon starts to look like spiritual advice, it is the beginning of the end for expository preaching. The tragedy is not when a sermon is "boring." The tragedy is when Christ is not preached. Indeed, the mark of a great sermon is not about leaving in the minds of people, “What’s the point today” but to have people exclaiming: “I have encountered Jesus today!” This is what good expository preaching can do. It brings out the Word of God in a manner that glorifies Christ. The sad thing in today's churches is that we try to make things interesting for the audiences. We try our hand at entertainment. We pick illustrations that thrill. We add so much calories and unhealthy literary cholesterol that are worldly that we miss out on the pure spiritual food we need: Jesus Christ Himself. Preachers, please don’t be afraid to be “boring” in the sense that you are always preaching the same point: Jesus Christ. 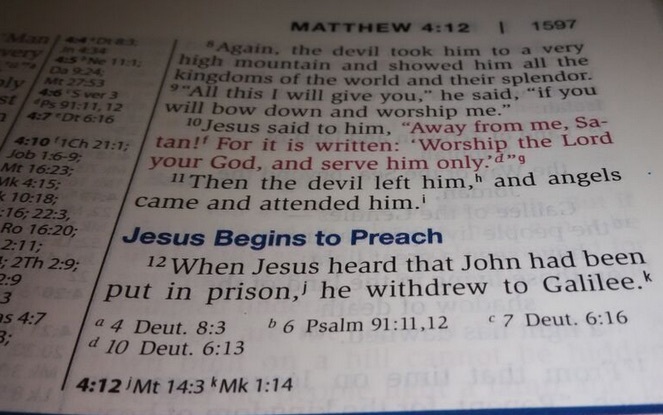 Preaching that is not about Christ and centered on Jesus is no preaching at all. Preachers must preach Christ, and not dispense spiritual advice.The tragedy is not when a sermon is deemed "boring." The tragedy is when Christ is not preached. First, it is NOT always verse-by-verse description of the text. Just because someone goes from one verse to another in succession does not necessarily mean he is preaching expository sermons. The Bible has many verses and passages. How we expound the Word depends on how we segment the passages to be preached. The word “pericope” describes a literary unit that “has integrity even when cut off” from the main chapter. This happens a lot in the gospels when the gospel writer describes Jesus’s ministry and switches back and forth various scenes. 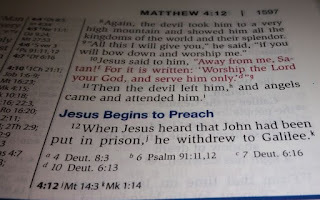 Take Matthew 4 for instance as the writer transitions from verse 11 to 12. What has the devil got to do with John the Baptist's imprisonment? Did the angels that ministered to Jesus tell him that? Did the devil move away from tempting Jesus to giving John the Baptist a hard time in prison? Is Jesus withdrawing to Galilee for Temptation 2.0? No! When we read the gospel of Matthew, remember it is the gospel writer trying to narrate the events according to his perspective of Jesus' life on earth. That is why we have four gospels that each give a fuller picture of Jesus and His ministry. Rather, it is to be understood as "meanwhile, at some point." Like a movie that switches from one scene into another, Matthew is trying to tell a story. Preachers must enter into this story and to tell it to the congregation. The big task in any expository preaching is to be able to select a "pericope" as appropriately as possible. Second, expository preaching will respect the genre of the text. The Bible comprises of genres like the Pentateuch (Moses Law); poetry (wisdom literature); Historical books (Joshua - Esther); the Prophets; the gospels (Matt - John); the letters; and so on. Recognizing the genre of each book is key to right interpretation. One cannot preach the Pauline epistles in the same way as the book of Job. Doing so would do injustice to the Word and bring confusion to the hearers. For one, the book of Job contains a lot of bad advice, especially those from the three friends, Eliphaz, Bildad, and Zophar. On the other hand, Paul's letters are excellent verse-by-verse candidates because they are written by Paul himself with an argumentation that is pretty much sequentially understood. A good illustration of what this means is from a very good text by Duvall and Hays, who describes literary genres in terms of sports. He compares and contrasts soccer and basketball. In the former, one can only use the legs to kick while in the latter, hands are essential to the playing of the game. Unless one understands the rules of the game, one cannot play the game. Likewise, unless one understands the literary genre of the passage, one cannot effectively understand the texts. Third, expository preaching makes clear a passage. According to the Westminster Dictionary of Theological Terms, it is "a view of preaching that makes clear the meaning of a passage or verse of Scripture." How can any preaching be clear in his message if he is not at first clear in his heart? I believe that preaching is not mere hard work but HEART WORK. For anyone aiming to do this well, take the advice of H.B Charles, whom I have come to respect a lot. He is one powerful preacher and is a classic example of Black preaching that enlivens the congregation's imaginations and love for the Word. He gives seven pieces of advice which I will list before the grammatical colon and paraphrase my understanding in italics. Start Early: This ought to be done so that the Word can be planted like a seed. This prevents last minute rush to try to cut and paste from all over the place. Read Repeatedly: This means looking through the text and to soak in the Word. Observe Carefully: Study the text just like preparing for an Inductive Bible Study class. Use the Bible, a pen, and paper to jot down observations, details, fine points, and let the Holy Spirit guide our understanding. Dig Deep: Here, we can use all the available resources to help us understand the texts. With our homework done in Step 3, we can challenge, affirm, or to expand on our prior understanding. Read Widely: There are so many valuable resources nowadays. Rather than to stubbornly insist on our own understanding, be humble to learn from others. Just be careful to pick the good sources. Write Clearly: This is an important step prior to delivery. It is one thing to prepare like a student but it is yet another to prepare as a preacher. This step is crucial as the beginning of preparing the sermon. Pray Fervently: This is what I feel should be done every step of the way. Though Charles had placed it at the end, I believe this can be applied all the time. What Charles is saying is that in prayer, we recognize that this is God's Word that requires God to work. In prayer, we submit our hearts to God and say to God: "May these words of my mouth and the meditation of my heart be pleasing in Your sight, LORD, my Rock and my Redeemer." All of these must be done with a constant focus on Christ. Preachers must ensure that all their sermons are "boring" in the sense that it is always about Jesus. For the Word of God is Jesus personified. A preacher who is not preaching Christ is no Christian preacher at all. If your preacher is not preaching Christ, I urge you to talk to him. Encourage him to do better the next time. Pray for him. Don't be afraid of too much of Christ, when the fact is that many churches have not preached enough of Christ. My readers, not many of us would be called to preach the Word over the pulpit. Some of us might do so in the future. Some of us may even have preached before. For all of us, we will be hearing preachers week in and week out. Some sermons will be boring. Others will not. More importantly, encourage your preachers to stay close to God by giving them time to study and to prepare for each Sunday sermon. Encourage them to preach Christ. Ask them to do good expository sermons. With the tips above, remember your preachers and pray for them every step of the way. Preaching is not just the preachers' job. It is all of us. That is why we are called the Church. Without the Bible as the foundation, the Church will eventually fall. With the Bible as foundation, we will be building the Church on solid Rock, Christ. Preaching Christ is a privilege. It is not a burdensome task. So, after Church, do not go around asking one another "What's the point?" Ask: "Where is Christ and how is Christ preached today?" If you do that regularly and to encourage your pastors to do that, you are doing your part in participating in the Ministry of the Word each Sunday. Copyright by SabbathWalk. This devotional is sent to you free of charge. If you feel blessed or ministered to by SabbathWalk weekly devotionals, feel free to forward to friends, or to invite them to subscribe online at http://blog.sabbathwalk.org . You can also send me an email at cyap@sabbathwalk.org for comments or inquiries. Note that views expressed are personal opinions of the author and do not necessarily represent the views of any person(s) or organization(s).